What Support do Young Huntsham Heroes get? We have a great team at Hunstham Court and a big building – so our job is to help by putting our building and network to good use and facilitate the child’s goal. Often this means working with the child’s parents and school to host a fundraising event across our reception rooms and grounds for that child’s cause here at Huntsham Court. It can be almost anything – such as a sports event, gala dinner, dance-athon, afternoon tea or just being the start or finish point for a fundraising challenge. Our team of expert event coordinators have the experience, knowledge and contacts to bring your vision to life. Frequently the causes important to a child comes from personal experience within their family, school or friendship circle – sometimes a traumatic experience, but always one where that child wants to make a difference! Often these good causes are not that well known about to the broader community so our job is to help our Young Huntsham Heroes spread the word and raise awareness of their good cause… to help educate the public about why this cause is important. ….of how incredible that child is for doing what they are doing. Annually we will host a Young Huntsham Heroes awards ceremony at Huntsham Court to raise funds for the project mission overall and specifically recognise each child. We will invite all the Heroes from that year and their families to our annual award ceremony, to publicly acknowledge what they have achieved and award them our special Huntsham Hero’s superhero cape & mask. As well as presenting them with a personal prize and gift voucher in recognition of what they have done for their named charity. They will also go in our Young Huntsham Heroes hall of fame. A lot of admin and effort goes into fundraising so part of our job is to facilitate our Young Huntsham Heroes by helping with some of the logistics of holding an event at the house and by reaching as many people as possible to raise as much money and awareness as possible. At the core of this initiative is the desire to encourage and enable children’s self belief that they do make a difference. Undertaking a charitable project is both hugely challenging and exciting. We want that child to develop their core skills of communication and organisational skills that nurture confidence and pride. Not just helping but putting actual cash in the tin – we pound for pound match the first £1000 raised by our Young Huntsham Heroes, awarding it to their cause at the annual award ceremony. Who can become a Young Huntsham Hero? 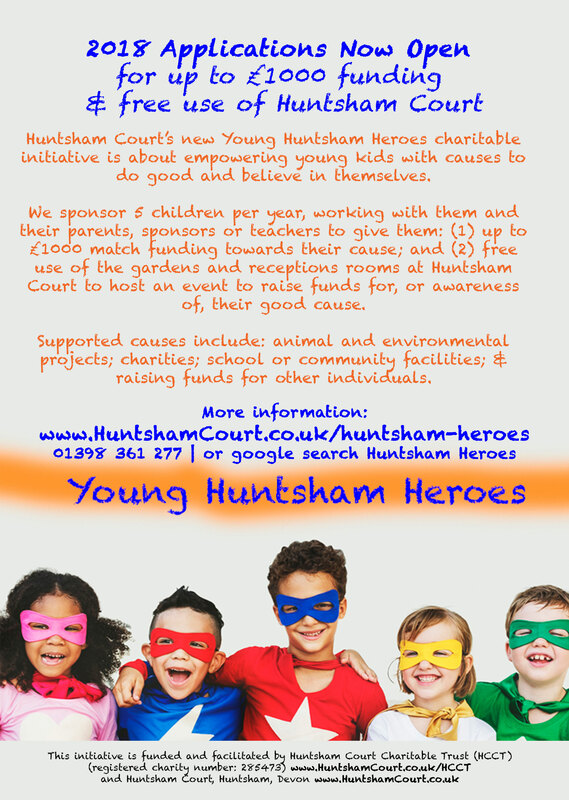 We sponsor up to 5 Young Huntsham Heroes every year. Each Huntsham Hero must meet 4 simple criteria (1) you must live within 20 miles of Huntsham Court (2) you must be under 14 at the time of being accepted as a Young Huntsham Hero (3) your fundraising or awareness activity must have a specific end or target date in the future and (4) you must be raising money for, or awareness of, a good cause personal to you. Please note, sponsorship is given at the complete discretion of the Young Huntsham Heroes programme team and we can only sponsor the same child once in any year and the same cause twice in any year. Applying to become a Young Huntsham Hero? You can apply anytime to become a Young Huntsham Hero and we review applications quarterly (next deadline 15 August 2018). All you need to do is ask a parent or guardian to download the application form below. You then fill out the form and ask one parent and one teacher to support your application. If you think you know anyone who might be interested int this project or if you can spread the word please download our email e-flyer or A4 poster below and share on social networks and with your school or community. The Young Huntsham Heroes Project is the first dedicated project set up by the Huntsham Court Charitable Trust (registered charity number: 285473) to mark Huntsham Court’s 150th anniversary. The intention and hope of the project is that it will run every year supporting up to 5 children annually within the community doing good deeds, and therefore supporting the good causes themselves. Please contact the team on either on the details below.